Our daughter had been asking to go for months. She is an animal lover. She really likes dogs. She also really likes aquatic life. We set up a fresh-water aquarium in her room. But, she had been asking to visit the Downtown Aquarium, Denver for some time now. When we put a trip on the calendar, she was ecstatic. 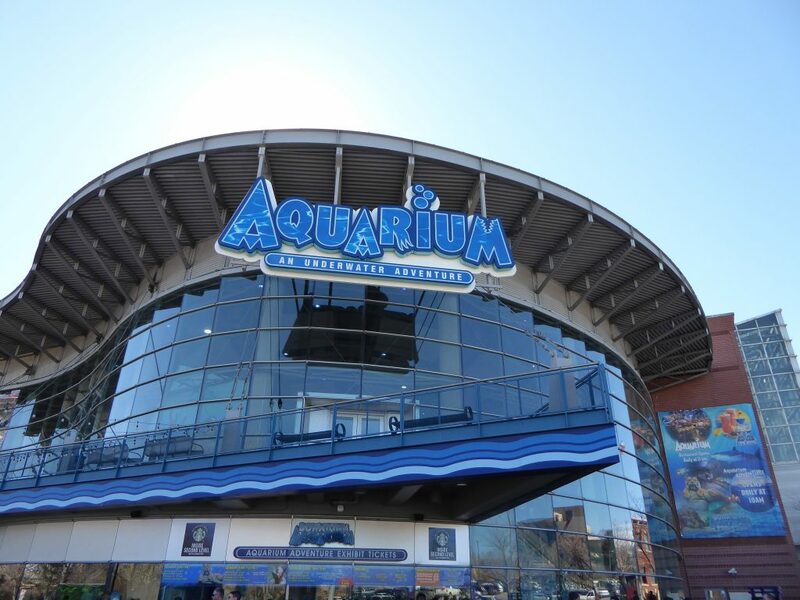 The Downtown Aquarium is located near many landmark Denver attractions, including the Children’s Museum, Elitch Gardens Amusement Park, the Pepsi Center (home to the NBA’s Denver Nuggets and the NHL’s Colorado Avalanche), and Mile High Stadium, the home of the NFL’s Denver Broncos. 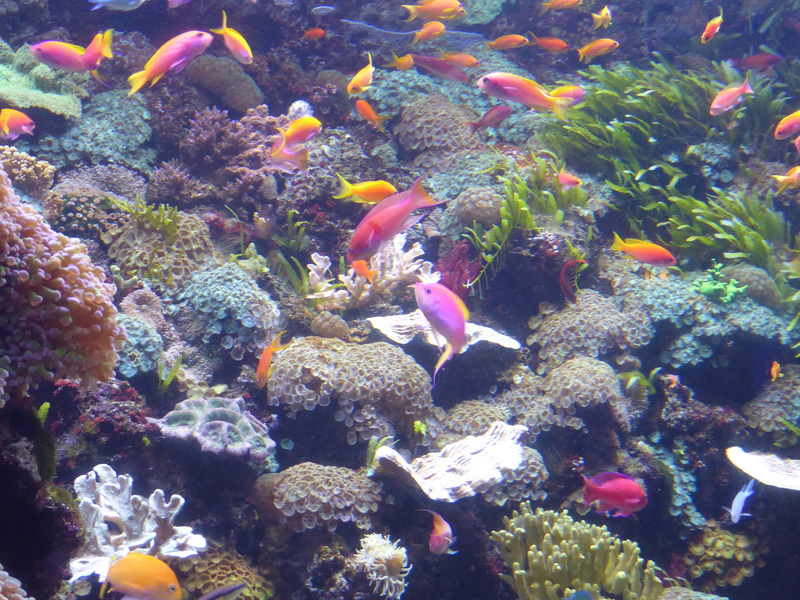 The aquarium is home to a number of fresh-water and sea animals, in addition to tigers, sloths and river otters. It is open every day. Our tour started with a mad dash to get to the morning Mystic Mermaid show. We had to rush through the exhibits, kids arguing to stop at this or that tank along the way, so that we could catch the performance of the three mermaids at the Under the Sea exhibit. 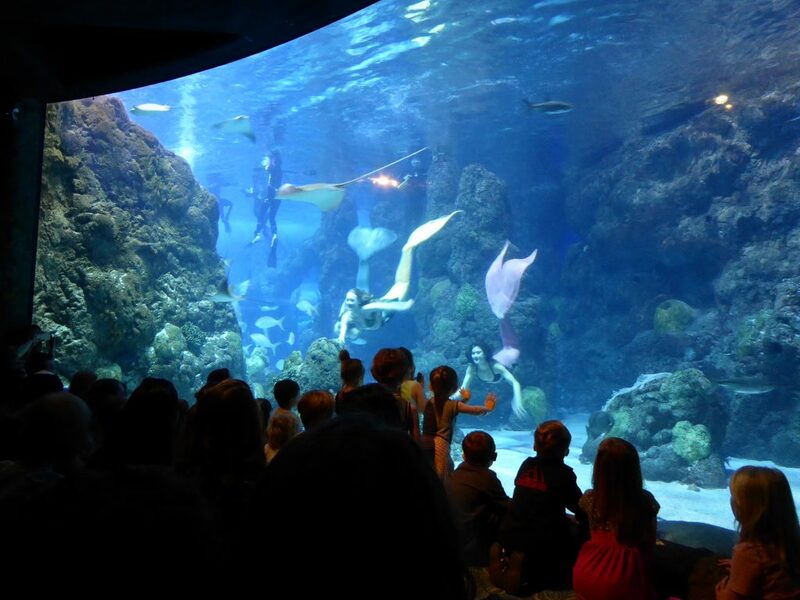 The 10-minute show delights the crowd as the mermaids speak to the audience from the tank, swim, dance, and inform the audience about conservation efforts in our waterways. 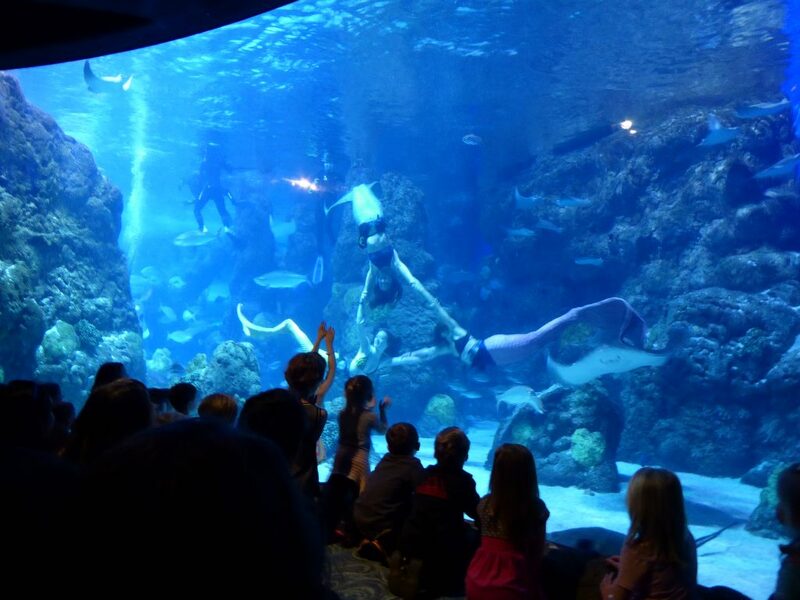 Our kids enjoyed watching the show and marveled at how the “mermaids” were able to swim and talk under water. After the show, you can meet the mermaids on a dry shore and get pictures with them. After the show, we swam upstream like spawning salmon, to the entrance of the aquarium to start our tour officially. Our first exhibit was the North American Wilderness, where we saw many fresh water fish, including those indigenous to Colorado’s mountains. 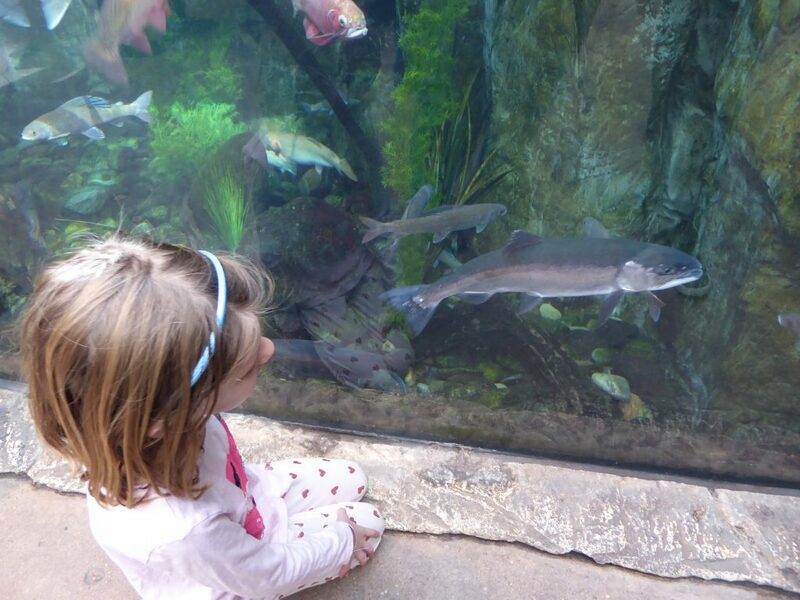 Our daughter was captivated by the fish in the North American Wilderness tanks. We found sturgeon, river otters, trout, alligators, and snapping turtles. Many of the tanks in the exhibit hall are waist high, allowing you to peer over the tank to the fish below. The hall also has an area where you can mine for gemstones in a running sluice. Next, we moved to the desert where we found bearded dragons, tarantulas, and desert pupfish, while learning about the highly adaptive features of these creatures. 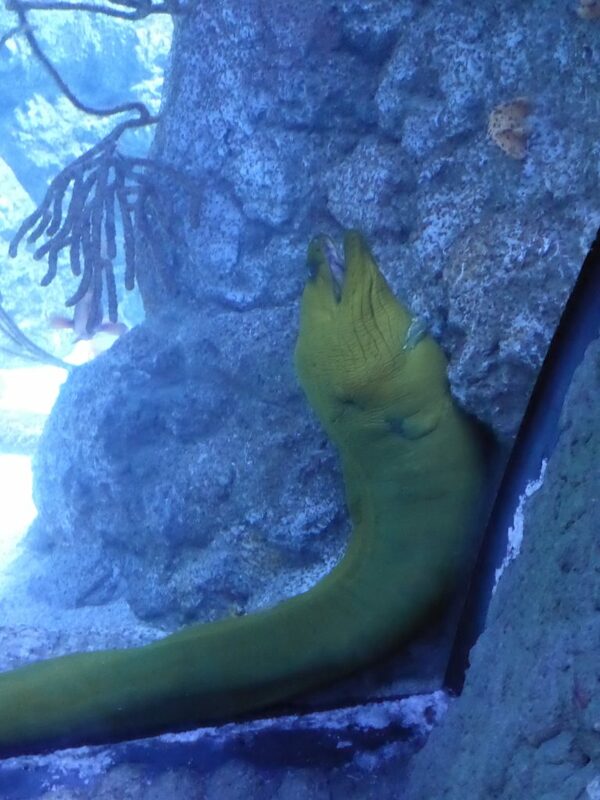 The hall was a stark contrast to the next exhibit, Under the Sea, showcasing a large tank of coral filled with sea life like rays and sharks, along with smaller tanks that serve as homes for seahorses (a favorite) and moray eels. Next, we entered At the Wharf, my wife’s favorite, where we could touch sea stars and admire sea urchins, barnacles, sea anemones, and rock fish. This smaller exhibit had a lot of hands-on experiences that we really liked. The Rainforest Hall was next, with piranhas and the Sumatran tigers. 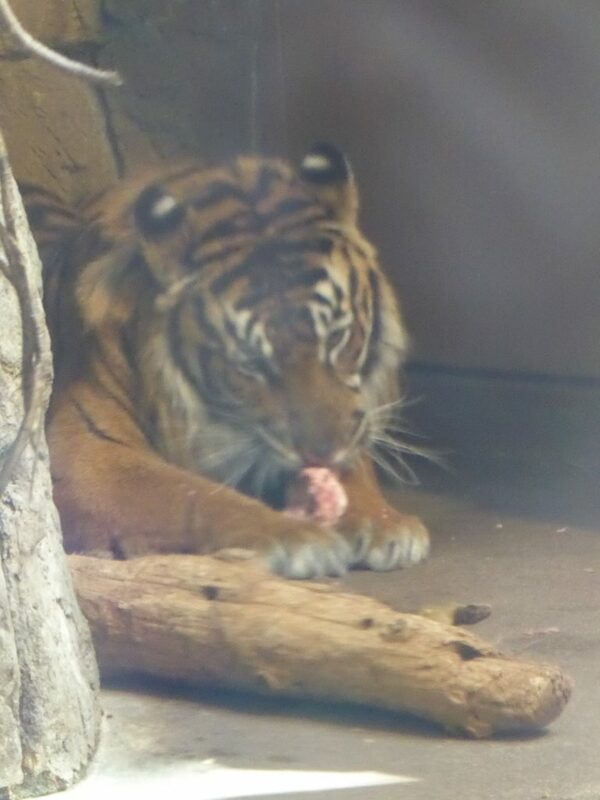 We were fortunate to see the tigers gnawing on some treats, and even heard one roar. The kids, however, were not as excited to listen to the loud call of the Macaw in this hall. 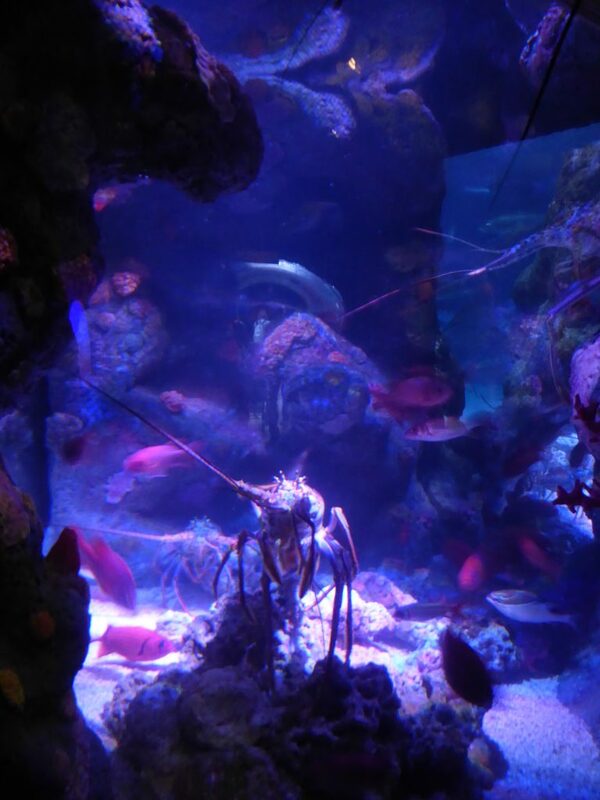 The Coral Lagoon had my favorite underwater specimen in the aquarium – the spiny lobster. We laughed as we watched one lobster scratching its head. 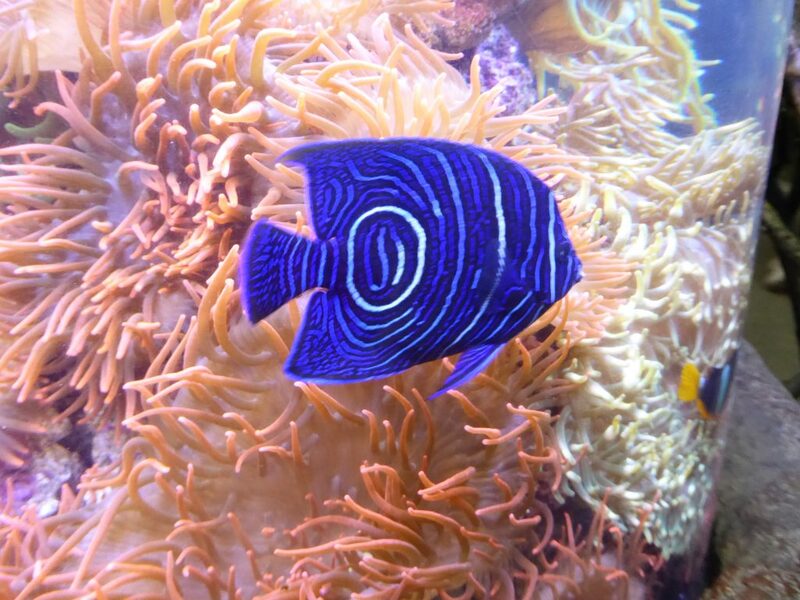 The Coral Lagoon also had some of the most colorful fish with amazing patterns, including polka dots and stripes. This lobster scratched its head and made us laugh. The Sunken Temple is home to Zebra sharks, lion fish and batfish. 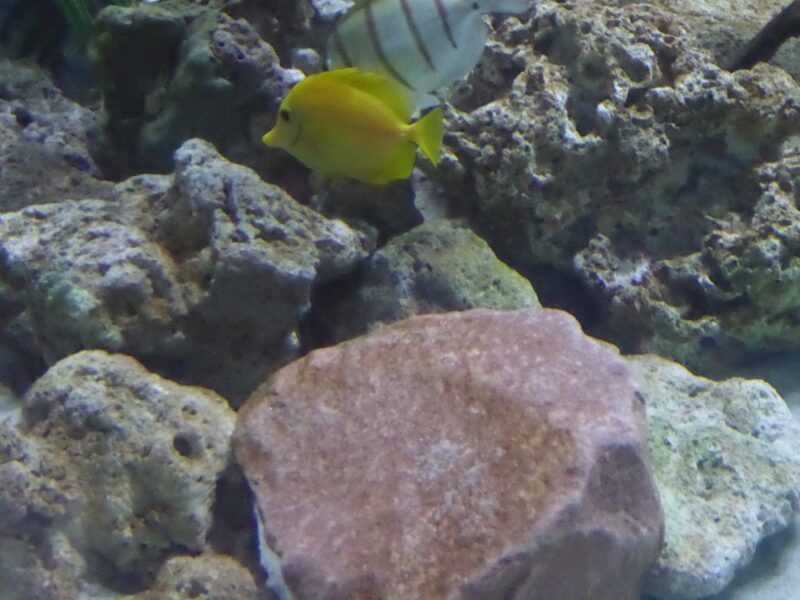 You would think you were at the zoo instead of the aquarium with all of the fish that look like other animals. 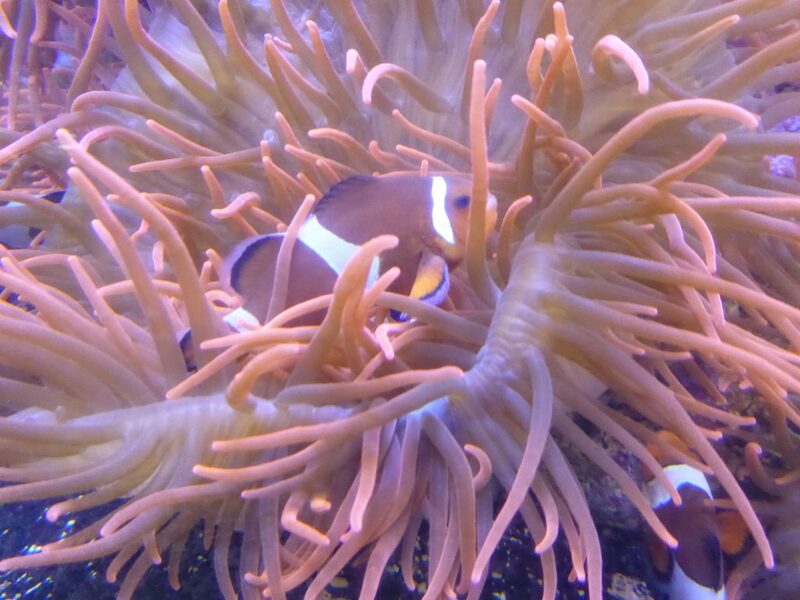 A clown fish in an anemone. Finally, we headed to the Shipwreck, an ecosystem next to the coral reefs where one can sometimes find sunken ships. Here, one also finds sharks, sea nettles and colorful jellyfish. As we wound our way through this last hall, we emerged At the Beach, a wharf-like locale which looks a lot like Coney Island or any other wharf, and where you can play games on the boardwalk, grab a snack at the food vendors, see the mermaids, check out a cagey octopus, and get your face painted. 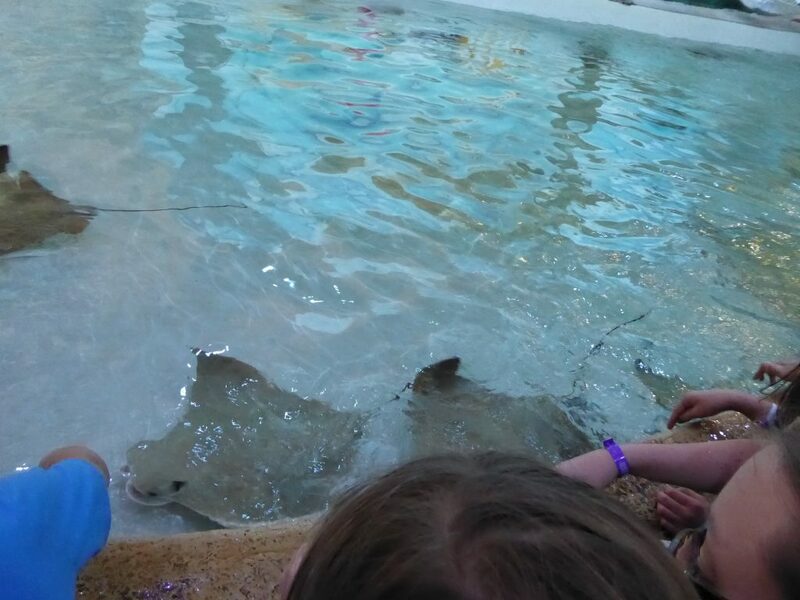 The area also has an artificial coconut tree you can climb (although you need to have shoes with laces to climb the tree) and a ray pool where you can pet or feed the rays. 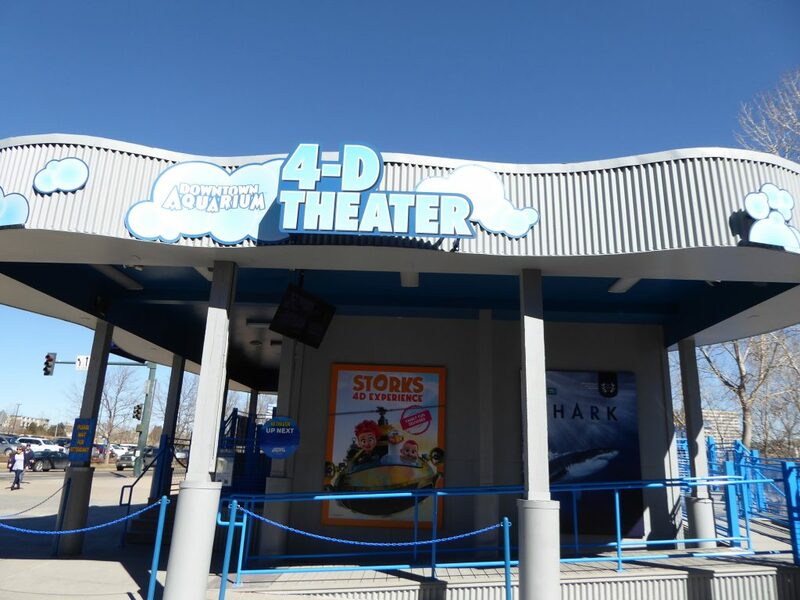 We upgraded our exhibit tickets to include a showing at the 4D Theater outside of the aquarium building. We saw a National Geographic feature on Sharks, and jumped and screamed as we were blasted with air and water while watching the sharks swim right up to us through the magic of 3D glasses. 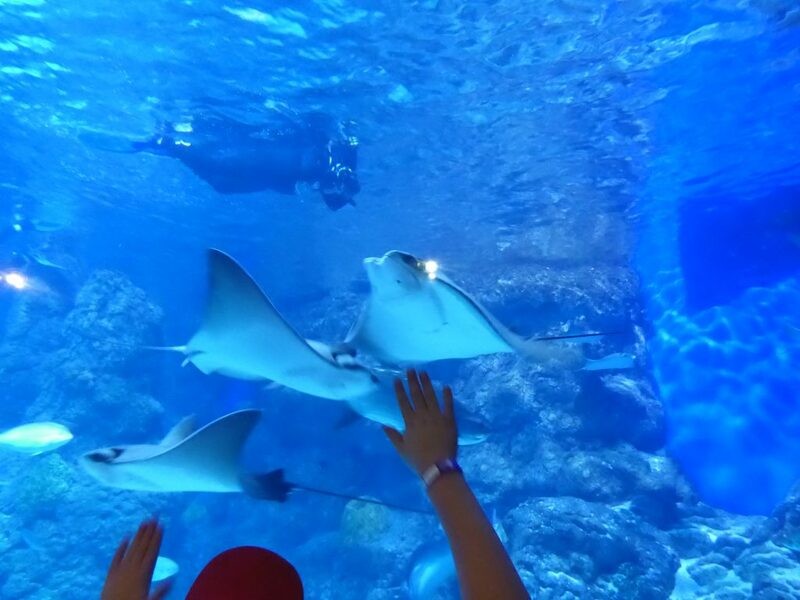 In addition to touring the aquarium, you also can book animal meet and greets, including a shark cage dive where you are immersed in the Shipwreck exhibit with five different sharks breeds. 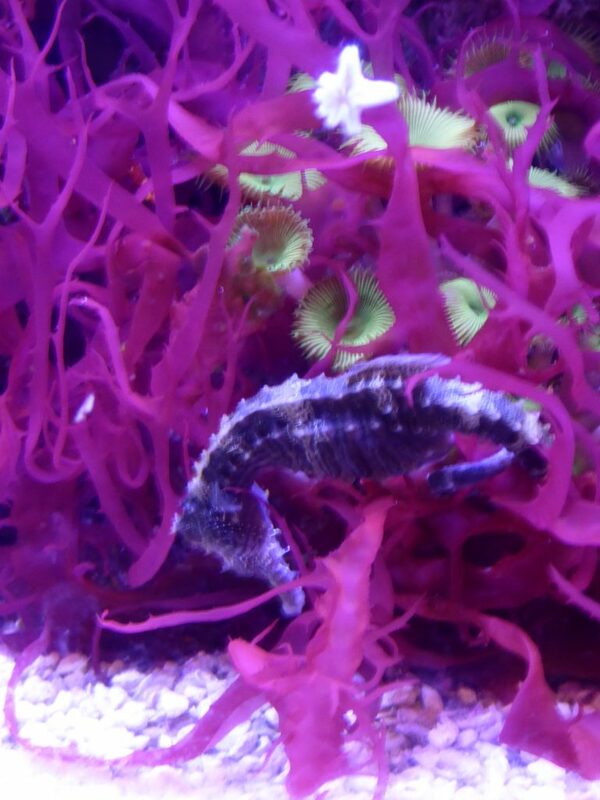 The aquarium also has a restaurant where you can dine while watching the underwater creatures and gift shop for guests. Unfortunately, there is only one restroom area in the midst of the second floor exhibit halls. This makes it a bit difficult with young kids (or adults) who have an urgent need to go. Do you like aquariums? 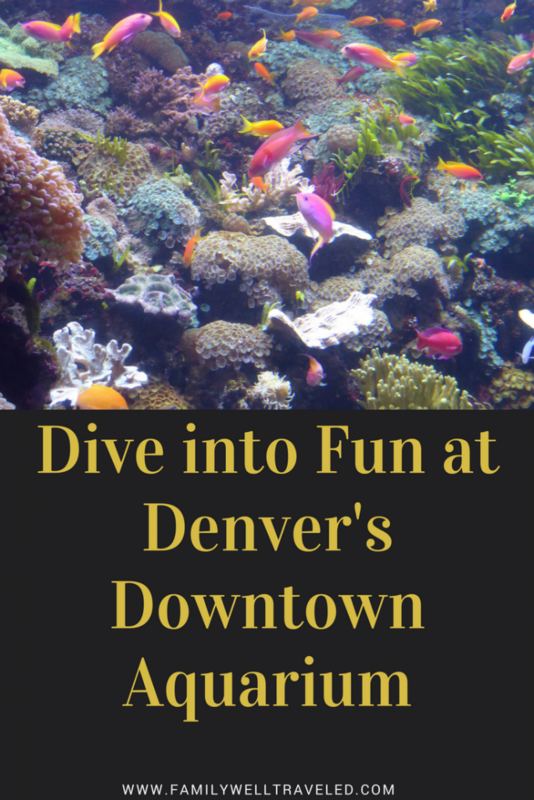 Have you visited Denver’s Downtown Aquarium? Tell us your thoughts in the comments. Sounds like you better book a trip to your local aquarium. Great post, very informative and you got some great photos too! The animals in captivity make me sad, but I’m glad that you guys had a fun time. Keep up the good work, I look forward to seeing where you next adventure takes you! Thank you. I don’t know what the answer is for the animals in captivity. I do know that the places we visit make a concerted effort to make the best life possible for those animals, most of them unable to go back in the wild. I too wish we loved in a world where they could roam free without the threat of human poaching, etc. 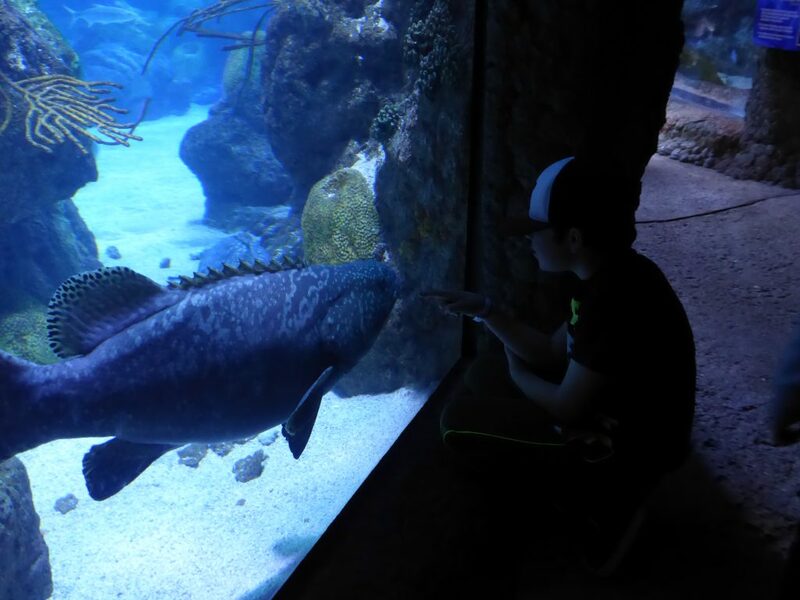 Our kids have learned so much from the aquarium and other habitats, and have such a respect and appreciation for protecting these animals. This is an interesting place. The mermaid show must be the hit there. I am saving this post for future reference. The mermaid show was our son’s favorite part. I am so happy to see how much you daughter loves animals and animal life. I think zoos and aquariums provide a fantastic glimpse into the lives of animals you may not know existed otherwise. They are also fantastic educational tools and help protect those species. It seems like a great aquarium too. They seem to have done a really nice job with the different exhibits – making them unique to each other. 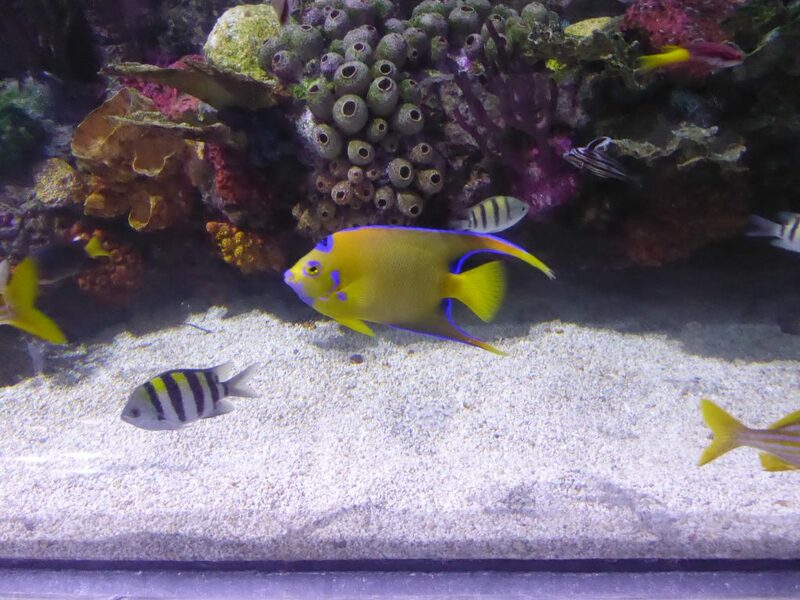 I love seeing the brightly colored fish with various designs (stripes, dots, etc), as you mentioned. There are so many kinds of fish and they all look so different!! I’m a big fan of aquariums and have never been to the one in Denver. Fun that they have a mermaid show! Usually, it is scuba diving, and that is not quite as magical. Thanks for the tip! Oh, they have scuba diving, too. But the Mermaid Show was special. Looks like a fun time was had by all! Agree on that blue fish – love the colors of it! 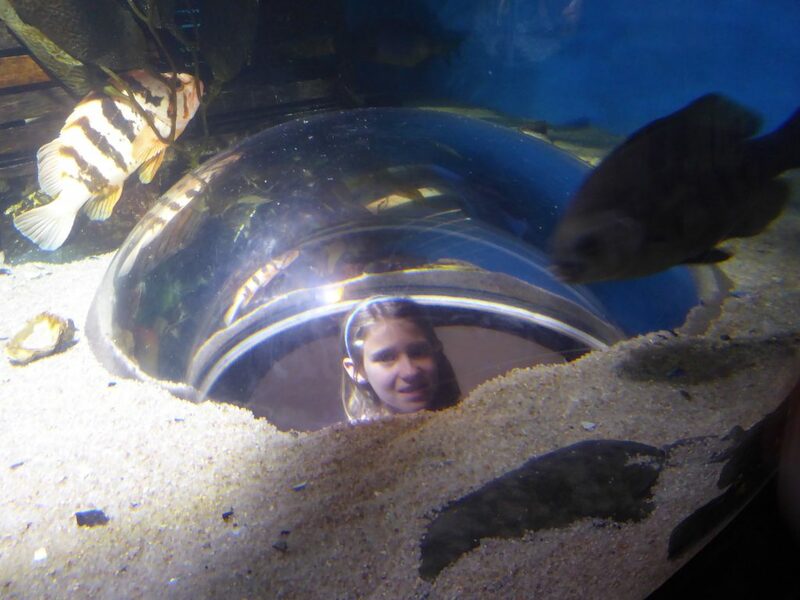 When my kids were younger, they wanted to go to aquariums in every city we visited. We never made it to Denver, though, but I’ve heard it’s spectacular. We always appreciate a good touch tank.